SourcePoint will host its annual Grandparents Day celebration on Saturday, Aug. 19, from 8:30 a.m. to noon. This event, presented by Ohio Living Sarah Moore and the Foot and Ankle Wellness Center, will be held at 800 Cheshire Road in Delaware, and is free and open to the public. 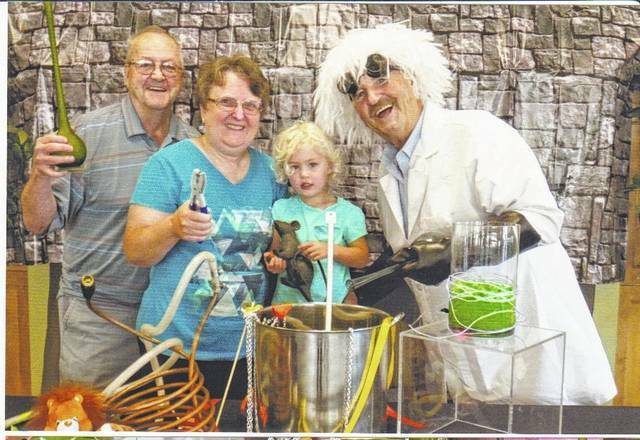 This year’s theme is “Science Fiction or Fact?” and grandparents are encouraged to bring their grandchildren “to the lab” to explore science through a variety of fun activities, including COSI science spots and fact versus fiction interactive stations. In addition, cake walks, water volleyball, and water rockets are back by popular demand, as well as the take-it-apart table. Pre-registration is requested for the day, but is required for water volleyball and cake walks. The event also is sponsored by Country Club Rehabilitation Campus at Delaware, Parkside Village Senior Living Community, Delaware Speech and Hearing, and Powell Senior Living. For more information or to register for activities, go to www.MySourcePoint.org/grandparents or call 740-363-6677.